For myself and I suspect many others, recalling school lunches evoke memories of stainless steel boxes and stacks of styrofoam trays, steaming pans of white rice, reheated chicken nuggets—on a good day—and an afterthought combination of iceberg lettuce salad and canned fruit cocktail. Dairy milk, a required component, came in whole, 2% or chocolate, sweating profusely in slightly soggy cartons. While much has changed in the last six years since the Healthy Hunger Free Kid Act of 2010, spearheaded by First Lady Michelle Obama, school lunches still leave much to be desired and the virtually unchanged recipe for the School Food Service branch of the last 30 years could certainly use a few menu tweaks. In the United States, the federal reimbursement rate for a child receiving free school lunch is $3.74, which falls $1.77 short of the actual cost to produce a meal in Hawaiʻi. This slim budget means that cafeteria managers and school administration must be frugal when it comes to feeding students, cutting costs and ordering shelf-stable, multi-purpose items that can be served over many meals. Additionally, the menu must adhere to the recently updated Federal Nutrition Standards in order for schools to receive full reimbursement. These standards, aligned with national nutrition recommendations, include fruit and vegetable requirements, increased whole grains, and the reduction of sodium and saturated fats. Despite the good intentions of these standards, the challenges of meeting them with limited kitchen facilities, a meager budget, and a lack of cultural or regional specificity, has resulted in intense backlash around less-than-ideal meals and wasted food. This is starkly represented by the emergence of the contemptuous internet hashtag #ThanksMichelleObama showcasing posts by students of limp, monochrome school meals of questionable content. The hashtag is just one of the many vocalizations against our broken food system, underscored by the fact that middle and high-school students would rather go hungry than eat school lunch. Although the Healthy Hunger Free Kid Act and national school lunch nutrition overhaul have done a lot to call attention to the public health needs of our children, much more must be done in order to see meaningful change. In Hawaiʻi, where we enjoy some of the world’s most unique and sought-after fruits and vegetables, our school lunches continue to look interchangeable with any other in the country. Currently, the Hawaiʻi State Department of Education's School Food Services Branch or SFSB serves over 100,000 students and staff each school day in Hawaiʻi. Despite being the 4th smallest state, Hawaiʻi has the 9th largest school district in the country and is the only state with a single food authority overseeing all DOE meals. In terms of procurement, this means competitive contracting for the least expensive, most efficient food service program possible, resulting in more imported bulk foods and fewer direct purchases from local farmers. Not only is imported food generally cheaper, but under a single food authority ordering in bulk, no farmer in Hawaiʻi could feasibly supply to all 255 DOE schools in the first place. Other challenges to procuring local include variable sanitation standards, produce seasonality, fossil fuel prices hiking up the cost of farming equipment, and a lack of streamlined communication with farmers. Despite all of the challenges Hawaiʻi faces, changing school food culture to better nourish students is not an impossible task. One way schools are finding success with local foods is through the Fresh Fruit and Vegetable Program. Launched in Hawaiʻi during the 2008-2009 school year, the FFVP grant program allocates funds to qualifying schools to purchase fresh fruits and vegetables for students to sample between meals during school. Because this program is not linked with the National School Lunch Program, the requirements around procurement are more flexible and many schools are looking to local farmers for culturally appropriate produce to engage students. FFVP is an excellent opportunity for food education with some Hawaiʻi schools using produce tastings to promote local farmers, nutrition, environmental sustainability, and cultural studies. To help promote these values, Kōkua Hawaiʻi Foundation rolled out the Fresh Choice Hawaiian Harvest Toolkit as an offering to all FFVP schools and other schools piloting independently run snack programs. The toolkit includes growing information, preparation methods, and highlights Hawaiʻi farmers to help celebrate the bounty found in our unique part of the world. 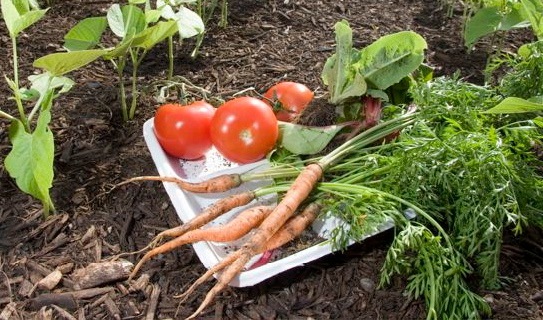 Another way schools are finding creative solutions to school food is through garden programs. Gardens are a unique space for children to explore their curiosity, creativity, and to nurture environmental stewardship and eating “close to the source”. Students observe the life cycles of plants, the science of soil, and a taste of the hard work that goes into growing food. In my own experience, I have observed students munching on freshly harvested green beans in awe, exclaiming “I’ve never eaten this before!”. In reality, there is a high probability that green beans have appeared on their plates at lunch, they are simply so far from the original fresh bean that they have become unrecognizable to the 1st grade eye. Hawaiʻi may never see a 100% local school lunch but as more people recognize the importance of local farming and the rich, agricultural legacy Hawaiʻi has to offer, advocates are finding creative ways to satiate a growing hunger for quality foods. At the policy level, Farm to School champions around the state are gaining a lot of traction including the recent appointment of Farm to School Coordinator, Robyn Pfhal who oversees the implementation of the F2S program per Act 218. This includes addressing supply and demand, consumption of local foods, and incorporating agricultural and nutritional education in schools. Currently, Pfhal is working to streamline the certification process for farmers interested in contracting with the DOE, along with finding creative ways to make use of off-grade produce. We are also seeing a growth in legislative support such as the recently proposed bill to provide tax credits of up to $50,000 for farms pursuing organic certification. While new growth takes time, many small acts of growth can make a big difference. It can be as simple as a kitchen herb garden or a perennial on a sunny deck. Furthermore, we need to start thinking more about how we eat. In some places, students have as little as 20 minutes to march through the lunch line, consume their food, socialize with their friends, and dispose of their waste. With such a tiny window of time, often in the setting of a loud, chaotic lunchroom, it is no wonder that much of the school lunch plate ends up in the trash. Not only must we teach our children to eat quality, close to the source foods, but we need to instill in them the value of eating slowly, savoring, and appreciating. After all, those green beans don’t grow overnight! After spectating a shocking lunch period in NYC, mother and filmmaker Astuko Quirk created a short documentary film showing the school lunch ritual in Saitama, Japan, from farm to table to recycling the waste. Produced by the Kohala Center, “Local Foods in Hawaii Schools” is a detailed report outlining the challenges and potential solutions to the current food landscape in Hawaii schools. CivilEats covers topics from food sovereignty to farming to nutrition and this in depth article offers an update on nutrition standards across the nation.